There is a gap in the annual rate assessments for Clapham from 1658 to 1663 which the records for a new tax help to fill. The Hearth Tax was levied on the number of hearths in a house, a direct measure of size, as well as the name of the occupier. Returns survive for Clapham for 1662, 1664 and 1674, and comparable data is available for the City of London, Middlesex and Surrey. Combining information from the Hearth Tax and rate assessments shows that the number of merchants increased only a little, from twenty-five in 1657 to thirty-two in 1662, and the number of larger houses then remained approximately constant until the early 1680s, although there was a slight increase in smaller dwellings. There is a considerable degree of continuity; while four of the merchants present in Clapham in 1657 had died by 1662, the remaining twenty-one (or their widows) were still there – fourteen since the late 1640s – and very few moved house. Seven large houses were added between 1657 and 1664, but three quarters of the merchant houses had been built before the Restoration and all of them before the Plague and Great Fire, events that are sometimes assumed to have been the driver of Clapham’s growth. Moreover, apart from one substantial rebuilding, the declared hearths for the houses hardly change during this period. We can assume that the Hearth Tax returns in 1664 describe the Clapham houses from the 1650s up to the early 1680s. The gentry and better-off merchants in London and the immediate suburbs had houses with seven or more hearths, and this is also true in Clapham; in 1662 only four merchant families were in houses with fewer than seven hearths, and those four were are all headed by widows and had five hearths. None of the yeomen farmers or ‘locals’ had seven hearths, although three of them had six. The overall distribution of houses by hearths is shown below. Only a third of the houses had one or two hearths, compared with the average proportion over the whole of Surrey and Middlesex of 64 per cent and 54 per cent respectively. On the other hand, 30 per cent of the houses have seven or more hearths, and the average number per house is just over six. This is very unlike an ordinary rural village, which might have had at most two or three large houses, and is much more typical of an urban environment. It is also different from other Surrey parishes near London: Putney and Mortlake, both twice the area of Clapham, have roughly the same number of houses with more than seven hearths, but about 120 houses each with only one or two hearths (compared with thirty for Clapham); the average number of hearths per house is under four. This is demonstrated in the table immediately below. The boundary between ‘middling’ houses in metropolitan London, lived in by merchants and professionals, and ‘great’ houses for the very rich and the aristocracy is usually put at fifteen hearths. On this basis, there were eight ‘great’ houses in Clapham. Dennis Gauden’s house, with thirty-nine hearths and more than 400 acres, was certainly substantial and notable enough to appear on maps; the Manor House had thirty hearths with a 200-acre park, but by 1670 it had been split into two parts and the park was usually let to a farmer. Next were two houses with twenty to twenty-two hearths; one was lived in by Hugh Forth and the other by Gualter Frost. John Gould’s house had eighteen hearths; John Arthur’s seventeen, although his successor lived in a smaller house; the house lived in variously by Thomas Corbett and Lawrence Bromfield had fifteen hearths, as did that of Thomas Langham, who had moved into the house of his fellow silkman Alderman Thomas Chandler. As well as these eight houses, there were a further nine with between ten and fifteen hearths, and eleven with between seven and nine. This indicates a remarkable concentration of wealthy merchants, and the table above shows that there are only five parishes around London with a comparable distribution of house sizes at the time. They fall into two groups: the first comprises three parishes west of the City of Westminster – Chelsea, Brompton and Kensington – frequented by the aristocracy and landed gentry rather than merchants. The second group is Hackney and Stoke Newington, both of which were well-known as Nonconformist centres after the Restoration; Hackney had, at 109, by far the largest number of houses of seven or more hearths. This is partly because it was one of the largest parishes, four times the size of Chelsea, three times that of Clapham, and half as large again as Hampstead. In practice it consisted of a number of distinct clusters of dwellings, all but one of which clusters individually shows the same housing distribution. Hampstead and Islington both had larger properties, but almost half their houses had only one or two hearths. 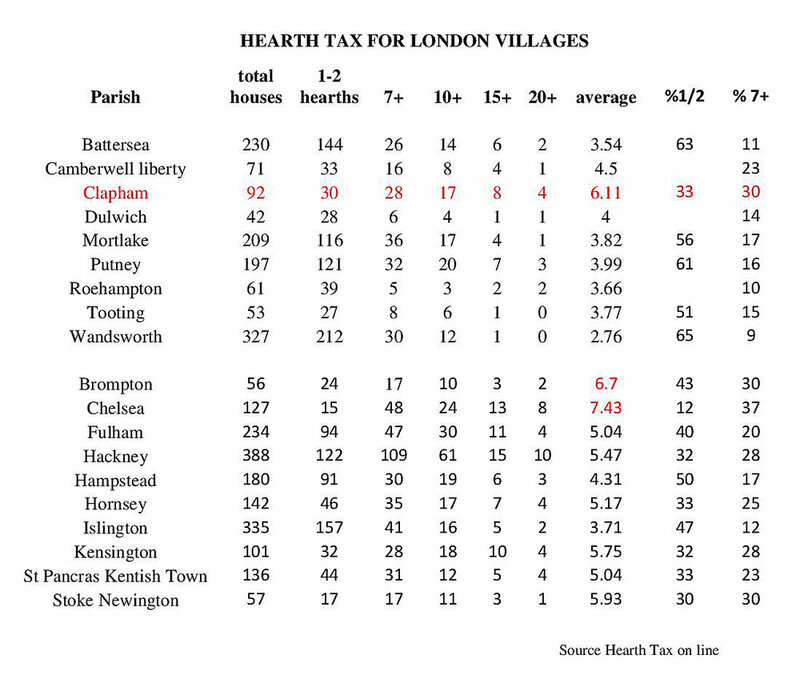 This analysis confirms that Clapham was indeed unusual in having such a large concentration of merchant houses, and a similar conclusion was reached by Dorian Gerhold in a study using the Hearth Tax returns of 1674. We can also use the series of hearth tax and rate returns coupled with a a variety of deeds and other sources to determine the location of most of these houses in Clapham. This is shown in the map below.